There are new Central Midlands League Black Dragon Badges North leaders as Westella VIP took advantage of Clay Cross’ match with Bilsthorpe falling to the weather as they put Welbeck Welfare to the sword with a ruthless display, the final score 12-1. Andy Coverdale and Alex Wood both scored hat-tricks, Chris Short added two and there were also goals for Rob Petch, Jack Walters, Andy Bagshaw and Lee Gardiner. The East Yorkshire side lead the pack by two points with two games in hand on their nearest rivals. Harworth Colliery made it six wins in a row, travelling to Phoenix and hammering the home side 7-0. Matty Bradley followed up his two goals in midweek with three more, Tommy Durrant scored twice, with a Tom Walker penalty and one from Billy Ball making up the final total. Harworth remain fourth, but have played more games than all of their rivals. Newark Town beat a spirited Sherwood Colliery by five goals to one at Collingham. Two goals just before half-time from Jordan Thomas and Dom Swingler set Town on the way and further strikes came from Reece Self, Sam Wilford and Ngoni Dongo, with Sherwood scoring a consolation through Josh Smythe. ‘A game of two halves’ is a bit of a cliché, but it certainly applied to the match between Appleby Frodingham and Ollerton Town. After a goalless first half, the Scunthorpe side scored four in a 12-minute spell midway through the second half, with the last 10 minutes producing four more, two for each side. Scorers in Frod’s 6-2 win were Nathan Watson, with a hat-trick, Jonathan Nicholls, Dayle Hutson and Joshua Turgoose for the home side, Alex Sennett and Kye Pilmore for Ollerton. Askern and Brodsworth Welfare shared the points in a 1-1 draw, Joe Byron’s goal for Askern being equalised by Brodsworth’s Shane Carver. It was the same score at Thorne Colliery where Bentley Colliery were the visitors. Darren Fell scored from the penalty spot for Thorne, Luke Smithson replying for Bentley. The new Black Dragon Badges South Division leaders are Clifton All Whites, who pulled victory from the jaws of defeat at Blidworth Welfare. The home side were two up through Max Curzon and Liam Theakstone, but Sam Leggitt pulled one back, before Ben Richardson and Jake Richardson snatched the points for Clifton with late strikes. Bulwell are second with Pinxton third after a narrow 2-1 win against Hucknall Town. Tom Ellis put Pinxton in front before the interval, Ben Waplington brought the sides level with the winner coming from the home team’s Luke Walker. Mickleover Royals’ long unbeaten run came to an end at Bulwell who ran out 4-1 winners. Royals did take a 21st minute lead through Louis Menson, but it was swiftly cancelled out by Conor Carter. Jake Fisher put the Bulls in front on the hour before goals in the last five minutes from Luke Attenborough and Carter sealed Royals’ fate. That defeat drops the Derby side temporarily down to fourth place. At last there’s something for Southwell City to smile about. Their 6-2 win at Holbrook St Michaels was their first since August and lifts them above Holbrook and out of the bottom two. Will Heath with two, Rory Brown, Stewart Gill, Marlon Waites and Charlie Wand were all on the scoresheet for Southwell, Michael Dunne responsible for both Holbrook goals. 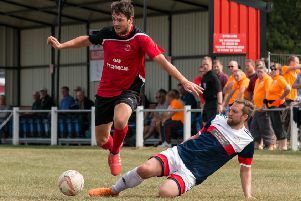 It was a productive afternoon for Hucknall Rolls’ Jack Allen, who scored four of his side’s goals as they thumped Harrowby Saints 6-1. Jamie Thomas got the other two, Niall Davie the Harrowby scorer. Still looking for their first win are Eastwood Community, who went down 4-1 at home to Mickleover RBL. Michael Mwwhan, Rob Lowrie, Rob Selby and Josh Williamson got one apiece for the Legion, Lewis Bentley on target for Eastwood. The first tie in the third round of the League Challenge Cup sponsored by Abacus Lighting saw Belper United make the 220-mile round trip to Easington United. Ash Dhindsa put the visitors one up on 35 minutes, but Easington fought back after the break and were left rueing three one on ones which went begging as Jordan Ball scored twice in the last 12 minutes to send Belper into the quarter-finals.